Pianista: The Legendary Virtuoso is a celebration of classical music. A lot of rhythm games have a handful of classical tracks, but they tend to be few in number, limited to the most well-known stuff, and in genre-bending arrangements that fit the tone of the game but don’t quite have that classical feel. By contrast, Pianista offers a vast assortment of classical pieces, from the likes of Beethoven to stuff that only classical aficionados would recognise, and all in beautiful piano recordings. And what better way to appreciate this assortment of music than by playing along? Pianista doesn’t stray from the rhythm game formula, tasking you to hit specific buttons as note markers fly down the screen. On the easy difficulty, you’ll mostly just be hitting the the key notes in a piece, but as you increase in difficulty and jump from the four-button mode to six, Pianista starts to take on the feel of actually playing a piano yourself. The two main game modes each have you playing a series of pieces back to back. Matinee is your standard rhythm game arcade mode, where you play three songs back to back, choosing from a limited pool of tracks for each round. At the end of the three tracks, the combined score is your total and, if you’re lucky, you’ll earn a spot on the leaderboards. 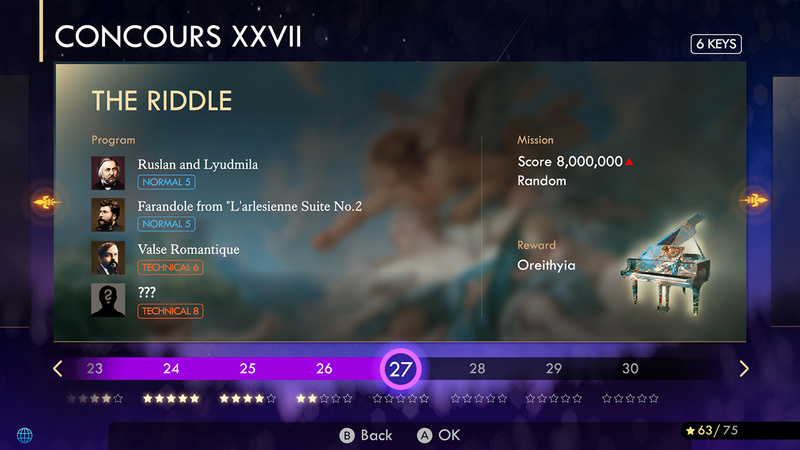 The other mode, Concours, is a challenge mode—emphasis on challenge. Each mission involves four progressively more difficult pieces of music, but you have a single life bar and any mistakes are heavily punished. There are 30 different Concours courses, and in the many hours I’ve played of Pianista so far, I’ve completed… three of them. I’ve attempted the fourth more times than I can count, and anything beyond that is locked off (and, presumably, even more impossible). While the challenge is most acute in Concours mode, Pianista is an insanely difficult game overall, even by rhythm game standards. 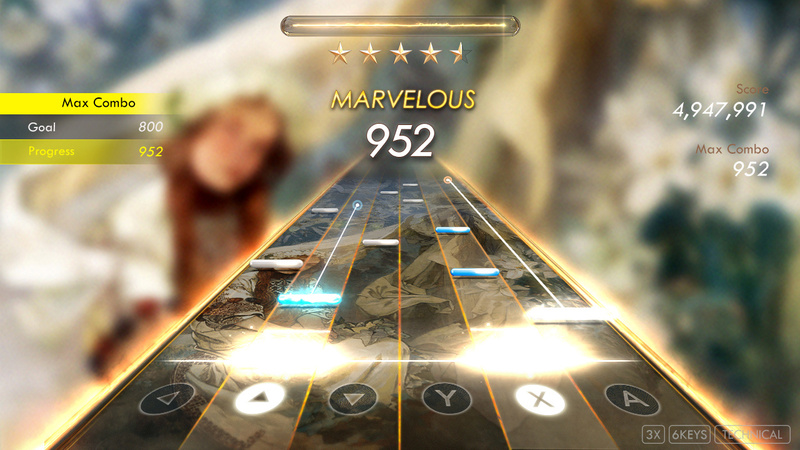 There are three broad difficulty settings (Light, Normal, Technical) and each piece of music within those has its own level of challenge on a scale of 1 to 9—standard rhythm game stuff. There’s also a choice of four keys or six, with the six key option naturally being the harder of the two. I’ve found my upper limit at four keys, Normal 4—the easiest of the Normal lot. On Normal 5 I might scrape a pass if I’m lucky, and anything Normal 6 or above is just impossible. I’m no master of rhythm games, but I play them a lot and I like to think I’m at least somewhat decent at them, until Pianista comes along like a stern piano teacher to rap me over the knuckles for my hubris. “Practice makes perfect”, the game over screen snarls. In Pianista, this is both a blessing and a curse. On the one hand, it’s easy to get dispirited, and many would be put off the game entirely after a couple of failures. On the other, Pianista‘s fantastic soundtrack and sharp beat maps, and the just-one-more-try nature of rhythm games in general, make it hard to just settle for a loss and leave it at that. And, of course, this is a game designed around piano, and playing piano isn’t exactly easy. However, I don’t think some more tools for helping you practice would go amiss. There’s no way to play a single song, so if you want to practice something specific, your only option is to play a Matinee run. If the song you want to practice doesn’t show up until the third round, you have to mess about with two other pieces before you can focus on what you actually want to focus on. A practice mode that let you play individual songs, or even specific parts of individual songs, would go a long way to making Pianista‘s challenge more palatable. But don’t be put off by the difficulty; even if you stick to Light mode, perfecting a song is as satisfying an experience as ever. 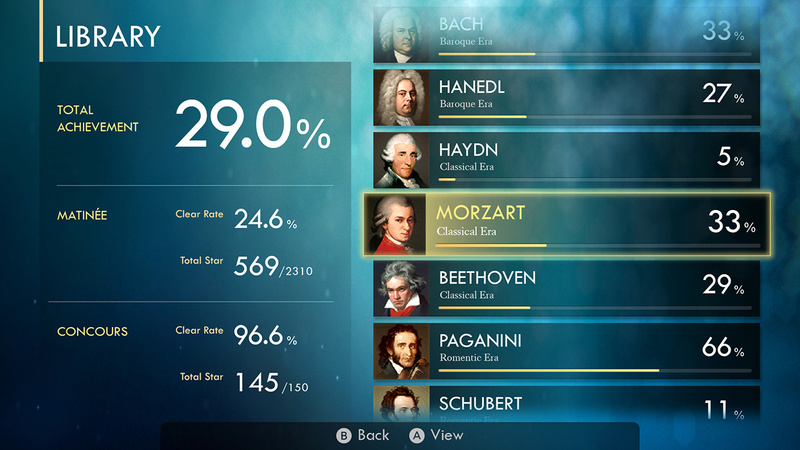 Beyond the rhythm game core, there’s a library full of easily-digestible information about the various composers and musical pieces featured, and an assortment of different skins for your piano bring famous paintings from the similar eras into the mix. 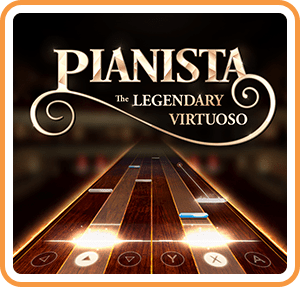 Like I said, Pianista: The Legendary Virtuoso more than just a great addition to the Switch’s growing library of rhythm games—it’s a celebration of classical music.